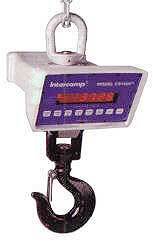 Intercomp’s advanced design makes this remarkable crane scale the first choice over other electronic units. It’s value packed with the industry’s most wanted features. The ultra-high resolution, 20-bit A/D converter provides the highest accuracy available /-0.1% of applied load. The unique design flexibility lets you choose the model and weighing capacity you need – ranging from 250 to 10,000 Ib / 125 to 5,000kg. Keypad setup and digital calibration enhance ease of operation. All electronics are shock mounted in a weatherproof cast aluminum case. This assures maximum protection against moisture, dust, and rough usage. High visibility 0.8 inch/20mm LED digital readout provides easy reading of weights; recessed push button switches allow simple, trouble-free operation. Power is supplied by 8 “D” cell batteries. Efficient microcontroller gives up to 100 hours of battery life.